Antennas are crucial to any cord cutter’s setup. 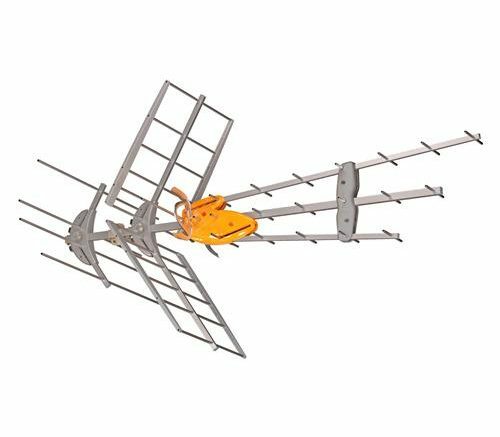 With the right antenna for your location, you can get the big four broadcast networks (FOX, NBC, ABC, and CBS) for free in uncompressed HD TV. That gives you the majority of the top programs on TV. And while using an antenna will fail to get you cable channels like ESPN, you’ll be surprised just how much live sports you’ll get on the four major broadcast networks. For example, you can get all your local team’s NFL games through your antenna, along with multiple Sunday games (for all other games, there are other options to pair with your antenna to watch NFL games without cable). So, once you have your antenna picked out and your DVR is hooked up then you can watch and record local shows. What happens if you have your antenna hooked up and your reception is less than clear? Well, first thing is not to panic. If your antenna isn’t getting the reception that you need there are several things you can do to fix it. Ideally you want a spot for your antenna that is open. Placing your antenna in the windowsill or as close to it as possible will ensure that the antenna is not obstructed and it has a clearer line to the broadcast towers which should ensure a stronger signal and better reception as a result. Of course, if you have a huge Oak tree out your window that may not help, but if your window is tree-free it’s a good place to start. Make sure to read your manufacture recommendations for placing your antenna in an area where it could absorb heat from the sun. Otherwise, a window can be a great help in clearing up any reception issues. Have you ever used a signal finder tool? If you have, you might have noticed that they ask you the estimated height for your antenna. The reason for this is that the higher up your antenna is placed, the better your reception is likely to be. If you’re using an indoor antenna, you might want to put it in the attic. You can always attach a longer cord to ensure that you can use that TV in the living room or anywhere else in the home. Having the antenna in the attic or the highest indoor spot, perhaps even by a window will give you the best shot at a strong signal. If the first two options don’t work, remember that you can move things around. Try changing the arrangement of your antenna placement. Maybe you catch a better signal if the antenna is across the room from where it is now. You won’t know unless you try, and if your signal strength isn’t that good to begin with, you really don’t have anything to lose in trying a new location. Look at the placement of your antenna now. Is it near your Wi-Fi router or near a surface or area that has an inordinate amount of metal? If it’s near your router or other tech, try turning it off and seeing if your signal improves. It might be something as simple as moving the antenna away from the metal or the tech. Keeping some distance between the metal or the tech that is causing interference will ensure that your signal strength and reception is able to improve. How far are the broadcast towers from you? What direction are they in? How much distance does your antenna cover? You’ll hopefully know some or all of this before you choose the antenna you want. If you want NBC, your reception is poor, and you find out the tower is 30-miles away facing South while your antenna is facing North, turning it may help. Likewise, choosing an antenna that scans the furthest will also be a helpful thing. Make sure your antenna is facing in a specific way to face the towers, and that will help get your signal strength up. Most antennas come with an RG59 coaxial cable. While this might be sufficient, you might get a better signal if you upgrade the cable. If you want to give this a shot, go with an RG6 coaxial cable. This more heavy duty cable provides a thicker conductor with more insulation and better shielding. These are just a few of the things that you can do if you’re facing reception issues. While simple, it’s important to remember that with antennas, a lot of times, the issues you have are simple and can be easily fixed!